There will be no more foreseeable distance. Nearly three years, six months, and two weeks ago, Tim and I embarked on the adventure of a lifetime. We did the unthinkable -- deciding to be together while also deciding to be apart because we had our respective dreams and goals. We stumbled along the way but our love never waivered. We've been long distance the entire time -- and 5,000 miles apart for the past three years. Today, we can say we have succeeded. Today, after 8 years of active duty service to our country Tim is switching gears, exploring new opportunities while serving in the Reserves. 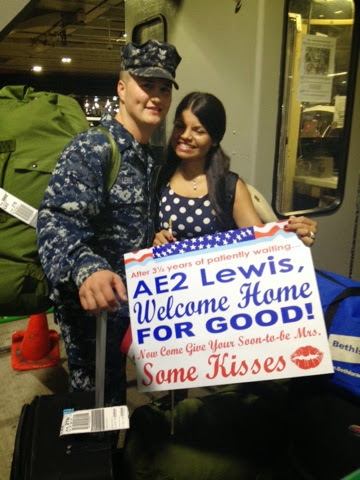 Words can not describe my pride -- both in him for his continued service to our country, and in us and our partnership. Welcome home *for good* baby! I'm looking forward to the lifetime of adventures that awaits us. That sign is just too cute!!! I am so happy for you both!! !